More details about the cruise passenger jumping into the water have now come to light since we first posted about it on January 16. It’s now known the man’s name is Nick Naydev and that he jumped from his deck 11 balcony onboard Symphony of the Seas which is operated by Royal Caribbean. After jumping into the water the small boat picked him up and when he arrived back on the pier he was told by cruise ship staff to pack his things. He was kicked off the vessel along with his entire group. He is also banned from cruising with the cruise line for life. 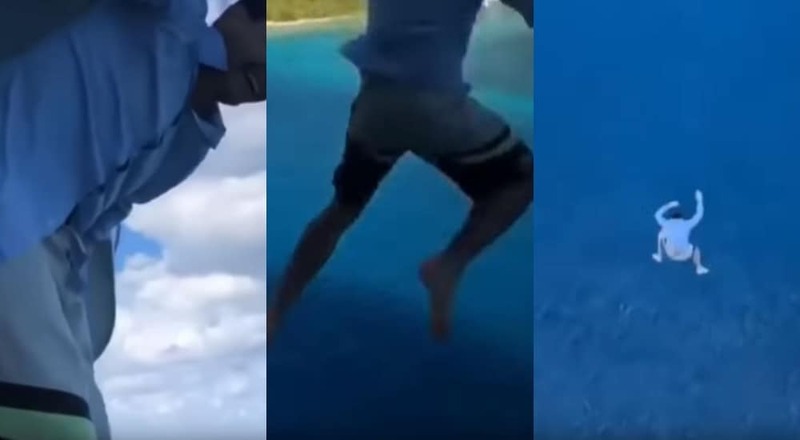 A new video has gone viral after footage was posted of a passenger who climbed onto balcony railings and jumped into the water for fun. This occurred when the cruise ship was in port. A video has been posted online of a passenger jumping from a cruise ship while in port. No details have been released as to when this occurred but it does seem to have happened during a port of call in Nassau, Bahamas. You can see the lighthouse in the background and the land which is located opposite the Nassau terminal which has some impressive properties on. No doubt the man swam ashore and got in some very serious trouble from port authorities and the cruise line. It is not known which ship he jumped from. We’re posting this so readers are aware just how dangerous this can be. He could have easily been injured by slipping off from the railings or when hitting the water. We have no doubt that once the cruise line found out who this guest was he was either removed from the remainder of the voyage or banned from cruising with the cruise line in the future. This is a silly act which should never be done. Something very similar to this happened before on a Carnival cruise ship. In 2014 a daredevil jumped off from the side of the Carnival Glory while docked at Grand Turk. In 2016 we also posted about a guest jumping from the bow of a large cruise ship while in port. In 2016 a young boy was captured on video climbing on the exterior side of the railings on the Carnival Liberty. The ship was at sea and it could have very easily had a tragic ending. There have been multiple acts like these and it never ends up good for whoever is involved. If manage to find out more details about this we’ll be updating the post.